INTERNATIONAL (by Judy Wardrope) Considerable time has been spent doing research following my attendance a little over a year ago at the United States Equestrian Federation (USEF) Young Horse Championship Symposium in Kentucky. On the agenda were presentations in the promotion of an initial USEF Young Horse Championship and Festival. For the most part, the presentations covered the scoring and judging of the proposed US classes. I read the literature and listened to the presentations, but, as with most issues, I tend not to automatically accept things on the surface; I look deeper and almost always have questions. As a result, I wondered how accurate young horse competitions were, in general, at identifying young horses that could go on to compete at the upper levels. And I wondered if soundness and longevity were factors in the judging/scoring. I was most curious to see how close such programs came to meeting their mandates. The final presentation in Kentucky, given by Joachim Geilfus, was entitled ‘Young Horse Development in Germany’, which also includes similar competitions for ponies. 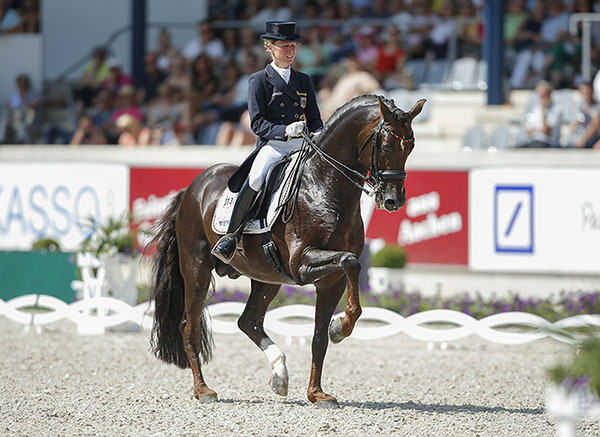 Geilfus explained that the system was based on the welfare of the horse, training based on the German principles, and consistency at shows. That made sense to me, but when he shared the statistics from the nearly 1,000 horses per year at the Bundeschampionat in Warendorf, I had questions. He stated that just under 20 percent of the horses that compete in the young horse classes (in the three Olympic disciplines as well as driving) make it to the top in their sport. I personally thought 20 percent was rather a low figure as it meant that 80 percent did not reach the upper or international levels despite the ‘screening’ classes and judging factors prior to the Bundeschampionat.